Obstructive sleep apnea occurs when a child stops breathing during periods of sleep. This stoppage of breathing usually happens because of a blockage (obstruction) in the airway. Tonsils and adenoids (lymph tissue located in the back and to the sides of the throat) may grow to be large relative to the size of a child’s airway (passages through the nose and mouth to the windpipe and lungs), and they may block the airway during sleep. What happens when the airway gets blocked (obstructed)? During episodes of blockage, the child may look as if he/she is trying to breathe (the chest is moving up and down), but no air is being exchanged within the lungs. Often these episodes conclude with a gasp and a period of awakening. Periods of blockage occur regularly throughout the night and result in a poor, interrupted sleep pattern. Sometimes, the inability to circulate air and oxygen in and out of the lungs results in lowered blood oxygen levels. If this pattern continues, the lungs and heart may suffer permanent damage. Obstructive sleep apnea is most commonly found in children between three to six years of age. It occurs more commonly in children with Down Syndrome. There are many muscles in the head and neck that help to keep the airway open. When a person (child or adult) falls asleep, muscle tone tends to decrease, thus, allowing tissues to fold closer together. If the airway is partially closed (by enlarged tonsils and/or adenoids) while awake, falling asleep may result in a completely closed passage. Obesity may cause obstructive sleep apnea. While a common cause in adults, obesity is a far less common reason for obstructive sleep apnea in children. A rare cause of obstructive sleep apnea in children is a tumor or growth in the airway. Loud snoring or noisy breathing during sleep. Even though the chest wall is moving, no air or oxygen is moving through the nose and mouth into the lungs. The duration of these periods is variable and measured in seconds. Always consult your child’s physician for a diagnosis because the symptoms of obstructive sleep apnea may resemble other conditions or medical problems. Call your child’s physician if he/she experiences noisy breathing during sleep or if snoring becomes noticeable. Your child may be referred to an otolaryngologist (physician who specializes in disorders of the ear, nose, and throat) for further examination. A sleep study requires a high level of cooperation from the child and may not be possible in younger and/or uncooperative children. Two types of sleep studies are available. For the first type, the child will sleep in a specialized sleep laboratory while being monitored carefully throughout the night. With the second type, the child wears similar monitors but sleeps in his/her own bed. During the sleep study, episodes of apnea and hypopnea will be recorded. Apnea is a complete airway obstruction lasting at least five to 10 seconds. Hypopnea is a partial airway obstruction that is combined with a significant decrease in the oxygen content of the blood. 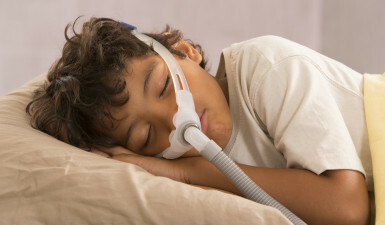 Based on the sleep study, sleep apnea is generally considered significant in children if more than 10 apnea episodes occur per night, or one or more occur per hour. Some experts define the problem as significant if a combination of one or more episodes of apnea and/or hypopnea occur per hour of sleep. The treatment for obstructive sleep apnea is based on the cause. Your child’s otolaryngologist will discuss the treatment options, risks, and benefits with you. Enlarged tonsils and adenoids are the most common cause of airway blockage in children, and if this is the case for your child, surgical removal of the tonsils (tonsillectomy) and/or adenoids (adenoidectomy) may be recommended. If obesity is the cause, less invasive treatments may be possible, including weight loss and wearing a special mask while sleeping to keep the airway open. This mask delivers continuous positive airway pressure (CPAP). Because the device itself is often clumsy, it may be difficult to convince a child to wear such a mask. In those cases, surgery may be necessary.